Puzzle game with window background transparency. Is there a better alternative to Bubble Explode? Is Bubble Explode really the best app in Puzzle category? Will Bubble Explode work good on macOS 10.13.4? 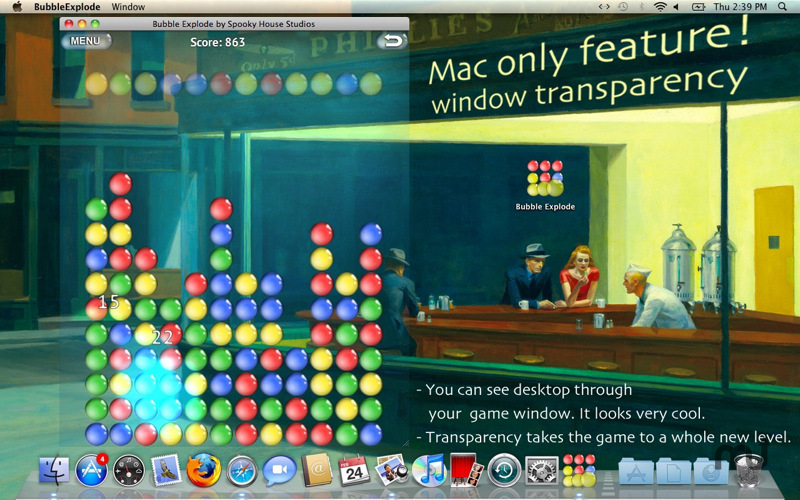 Finally Bubble Explode is on your Mac! And now even better than before: the awesome new feature is window background transparency. You can see desktop and other windows through Bubble Explode background, and it looks amazing! Check out screenshots and give it a try! Bubble Explode needs a review. Be the first to review this app and get the discussion started! Bubble Explode needs a rating. Be the first to rate this app and get the discussion started!